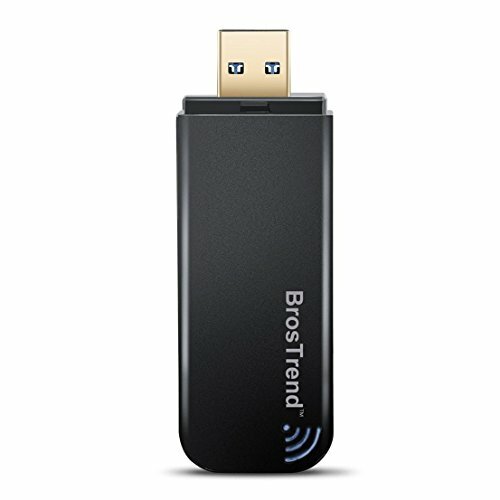 BrosTrend AC1 1200Mbps USB wifi adapter enables you to take full advantage of the latest 802.11 ac WiFi technology to connect your PC to the wifi network with speed of 867Mbps at 5GHz WiFi band or 300Mbps at 2.4GHz Wi-Fi band, you can greatly improve your wi-fi signal and get much faster wireless network connection for online gaming, HD video, high quality music and Internet surfing etc. AC1 USB wifi adapter supports dual band wifi, you can use the 5GHz WiFi band for lag-free gaming and HD streaming, and the 2.4GHz band for video calls and shopping online. You can use AC1 wifi network adapter to upgrade your computer to work with the latest AC dual band wifi routers for faster speed and better wifi range; while AC1 is also backward compatible with the previous Wireless N or Wireless G routers. AC1 wifi network adapter comes with gold plated USB 3.0 port which works 10 times faster than USB 2.0; meanwhile it works with both USB 3.0 or USB 2.0 port on your Windows desktop and laptop. 1. For getting Full 5GHz WiFi Speed On Windows 10, please update with latest driver on our website. For Linux or Raspbian, we offer manual.